India’s PM Narendra Modi has tweeted pictures of his mother’s first visit to his official residence in Delhi. Twitter users have praised Narendra Modi’s decision to invite his mother, Heeraben Modi, at his new home. Heeraben Modi, who is in her nineties, lives in her family house in a town in Gujarat, the prime minister’s native state. Narendra Modi became prime minister after his BJP party won the general election in May 2014. “My mother returns to Gujarat. 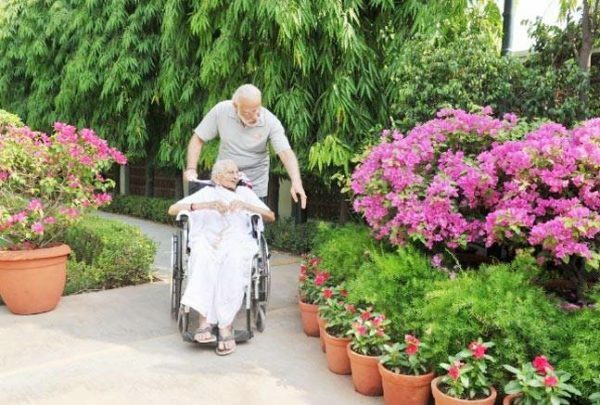 Spent quality time with her after a long time & that too on her 1st visit to RCR [Race Course Road],” Narendra Modi tweeted.